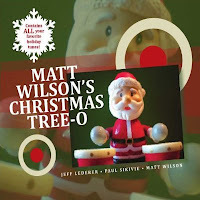 bebopified: CD Review: "Matt Wilson's Christmas Tree-O"
The “Tree-o” isn’t Matt Wilson hipster talk for “Tree” (as I first thought, duh) but holiday speak for “trio”: Matt on drums, Jeff Lederer on reeds, and Paul Sikivie on bass. Wilson gets his money's worth with Lederer, who plays soprano and tenor saxophones, piccolo, clarinet, bass clarinet. (Leder is also responsible for the toy piano.) He’s not afraid to squawk and squeal. This is a CD of many musical moods: a “Winter Wonderland” that blends lazy loping with serious blowing; the playful, slightly wicked waltz of "The Chipmunk Song;" a thoughtful take on John Lennon and Yoko Ono’s “Happy Xmas (War Is Over),” stitched together by a march rhythm and dusted with sleigh bells; a meditative “O Come O Come Emmanuel,” followed by the manic “Mele Kalikimaki” (with timpani flourishes); a wistful “I’ll Be Home for Christmas;” that crazy “Hallelujah Chorus,” with skronky sax and booming timpani; a high-pitched, caffeinated “We Wish You a Merry Christmas” to end, which, at about a minute and thirty seconds long, doesn’t linger at the door. All of it deliciously, wholeheartedly jazzy. Wilson’s “tree-o” could just as easily be playing Coltrane or Miles Davis or Monk. If it weren’t for the fact that you’ll probably recognize all or most of the tunes because you’ve heard them your whole life and can’t escape them in grocery stores, gas stations, and shopping malls this time of year, you wouldn’t even know these are Christmas songs. Hallelujah, a Christmas jazz album that’s not just for Christmas. Here's NPR's Christmas Tree-O Tiny Desk Concert.